Not all adventures turn out the way we plan, and not all partnerships are profitable. But sometimes when things go wrong, the only person we have to blame is ourselves. In today’s tale of the Underworld, Vandigeth weaves a story of adventure and betrayal while illustrating the danger of losing sight of Virtue in “The Cavern”. She stood on the rocky precipice looking out upon the dense rock that filled this cavern. The sound of water filled the air before her; its smell gave what little freshness there was to be had in this dank place. A humid mist permeated the air and diffused the light across the cavern. Jumping down from her precipice, she rejoined her companions across a small wooden bridge over the sheltered river. The stalagmites and other cavernous formations spoke to the absolute timelessness of this place. To her left was a modest waterfall, an obvious inlet of moisture from the surface far above this place. The tread of one’s shoe was important here unless great care were taken. Moisture put off by the river both beautified the cavern but acted as a deadly host to her earnest companions. A simple mistake with one’s footing could result in a fall into the river below, or gravity between the rock and one’s head. However, she had much more experience moving through these so-called ‘catacombs’ than any of her companions. Finally, she caught up to the companions. Two of them, both male, were a wealthier sort from the cities. Flush with cash and equipment, they hired her to guide them across the continent on a pilgrimage to a famous shrine of Honor. Both were showing their inexperience now as they began to question her about the caves to which she had become so familiar. Shroud of the Avatar will be home to many adventurous souls; many of which will team up with others in their quest for glory and riches. And in the end, they may discover something more precious than fame and fortune; they might instead find lasting friendship. Thus, it seemed fitting that our next featured Tale of the Underworld be one of both adventure and fellowship. Presenting, “The Expedition” by Archaaz. Noor sat silent and still upon a high outcropping overlooking the town of Niverale, nestled in the distant valley below. The sun had not yet pierced the horizon, and the world was still bathed in the gray miasma of early morning. A sudden late autumn breeze whistled down from the mountains above, and she pulled her woolen cloak tighter against the chill. Her perch afforded a splendid view of the town, spread out along both sides of the narrow valley, split by the gentle river Vuryn- a river that would slow to a frozen trickle with onset of the winter snows, and swell to a raging torrent with the spring thaw. Smoke from a hundred chimneys curled upward, dissipating wistfully into the pale, predawn sky. Today’s featured Tale of the Underworld is one of our shorter entries, but a testament that a powerful story need not be lengthy. Without further delay, I present, “The Warrior and the Flower” by Tekkamansoul. The warrior opened his eyes. Cold, hard ground. A far-off glow. The sound of a river. He tried to move, but his body wouldn’t listen. His eyes refused to focus; his brain, to recall where he was or what he was doing. With a forceful grunt and an exertion of muscles strained beyond their limits, he managed to prop an arm beneath him and roll over onto his back. Thud. The pain was unbearable. First off, I want to say how humbled both myself and the team were by the amount of amazing stories that were submitted. What I thought would be an easy task in selecting the best turned out to be quite the epic quest! One that I must admit, I could not complete without some alterations to my plan! Which is why every day this week, I will be publishing one of our favorite FIVE Tales of the Underworld! Today, we begin with a tale of unexpected adventure. Join me in celebrating Corlag the Bard’s Tale of the Underworld. It all started when Krelm ventured north east into the forest, to hunt for a stag to feed his family. It had been a lean year for crops, and what little they had after their tithes had not lasted long. They would starve if he didn’t make the journey. That would be a worse fate than risking the danger that lie within these woods. This week’s Community Spotlight star will be very familiar to our UO fans! Markee Dragon, a longtime community leader for UO, has been an advocate and voice for Shroud since its conception, with his interviews with Richard reaching thousands of fans and his Shroud of the Avatar Fansite offering a home to all those with a passion for New Britannia! He is currently hosting a live SotA roundtable each week on Saturdays from 5 to 6pm Eastern at www.twitch.tv/markeedragon. If you missed this week’s episode, you can watch it right here; AND get a sneak peek at the exclusive Warrior Concept Art featured on the show! The great thing about Markee Dragon’s Roundtables is that ANYONE can join. And I wouldn’t be surprised at all if a Dev or two manage to sneak into future broadcasts! If you would like to participate, you can join via Google Hangouts. And in addition to exclusive “sneak peaks” of content and Dev interviews, once SotA is launched, Markee plans to air game-play live streams and create YouTube episodes for content a well. For now, check out his Shroud of the Avatar channel on YouTube to catch up on all the interviews and roundtables you may have missed! 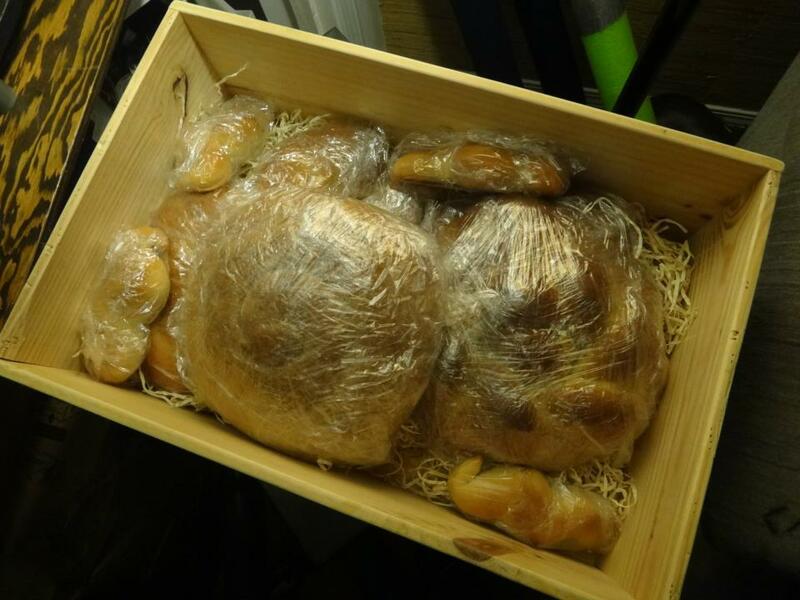 This week, we shine our Community Spotlight on an amazing community member, Vitralis, and his very unique tribute to all things edible and Britannia. And I’m not just saying that because he sent us food! 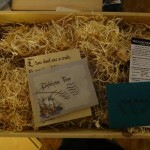 Though he did put together an amazing care package of home backed goodies, with some spectacular SWAG and an amazing hand-detailed shipping crate that made it feel like Christmas around the office. 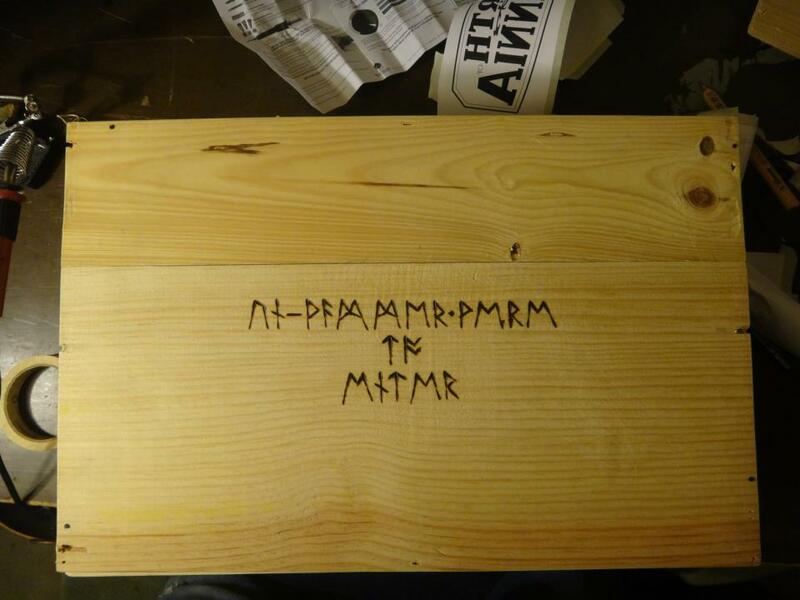 Here is a short video of Richard opening the Runic lettered , wax sealed letters that accompanied the package. Vitralis has been an active member of the SotA community from the beginning, sharing his passion and excitement with us and other community members in more ways than I can count, but most notably, by hosting live Dragonsmeets, where we can all celebrate and share in the bounty of New Britannia. Despite his busy schedule, Vitralis was kind enough to extend me a brief interview. Vitralis the Blue: He’s an old, salty cook, seldom seen without his worn black fishermans cap. It covers the few remaining strands of stubborn hair on the top while defiant poofs of long, grey locks erupt from the sides and back of his head, held in check by a single leather thong tied neatly into a clove hitch. His days are spent in the kitchen of a tavern that he and his sea faring mates founded together when they retired from the salty life. When not crafting his foreign, peculiar, yet undeniably popular culinary creations, he’ll hang up his apron and saunter out into the pub. Despite his generous age, he’ll out drink and outlast everyone in tavern, regaling them with adventurous tales from his youth and delighting the crowd with concertina tunes. Yet somehow, he’ll always be up at dawn, preparing breakfast for his guests. What do you hope to facilitate in the community with Dragonsmeet? So far, I’ve hosted two hangouts via Rustic Dragon. The first was the Kickstarter Celebration on April 13th and recently, the Inaugural Dragonsmeet on May 1st, which I hope will be the first of many more broadcasts. The plan moving forward is to have regular semi-monthly (and potentially even weekly) broadcasts at varying times to accommodate international fans, all in the same format as May 1st’s Dragonsmeet. It will consist of talk-show style broadcasts with regular and rotating segments, interviews, facilitated discussions for both pre-determined Ultima related topics and recent SotA development, and an open-ended off-the-air “after party” once the stream ends for everyone to let it all fly. Additionally, I hope to be able to interview the movers and shakers in the fan community, one per broadcast. I would also love to interview any willing Portalarium folks as well. These wouldn’t be SotA related interviews, however. Rather, I want to know everyone’s Ultima/Lord British story. I want to know how everyone came to jump through a Lunar Rift and end up at Portalarium. I want to know what games inspire them, who their heroes are, and what things excite them as much as SotA excites all of us. I want to give the Port team an opportunity to talk about themselves instead of just their work. Inquiring minds want to know! This may sound silly, but I’m looking forward to everything that happens between now and the end of development of the final chapter. When I’m not knee deep in my Dragonly doings, I’m actually an Interaction Designer by trade. Because of this, I absolutely can’t wait until the developer forums open up and I can sink my teeth into the myriad juicy problems that doubtlessly will be there to solve. Portalarium will get way more than they bargained for when they dreamed up the Developer pledge level. Prepare the inbox for wireframes, affinity diagrams, persona maps, and slews of sketches detailing my visions for item design and interactivity. Will they be used? Maybe, maybe not, but I’m still going to have a great time making them! As for the game itself, I’m one of those strange people that enjoys MMO’s but doesn’t particularly enjoy playing with people. I’m drawn to games like WoW and Age of Conan due to the sheer vastness of the world. I love exploring and discovering new places. Massive games tend to satisfy this need but I’ve always played solo. Admittedly, however, the few times I’ve had the opportunity to play online games with my real friends, it’s been an amazing experience. Thus given my gaming tendencies, the fact that awesome, like-minded gamers are coming together via the Dragonsmeets, and the proposed model for limiting the people in the world to those most relevant to you, I can’t wait to jump into New Britannia with both feet and travel with my new friends. Hopefully we can have a Dragonsmeet at the Hearth of Britannia in New Britannia. How awesome would that be? There are many other elements that I’m excited for as well, but anyone still reading at this point deserves a medal. And if you are still reading this and want to continue the conversation, all of my contact information is available at the bottom of www.rusticdragon.com Send me a message and introduce yourself. I’d love to meet you. 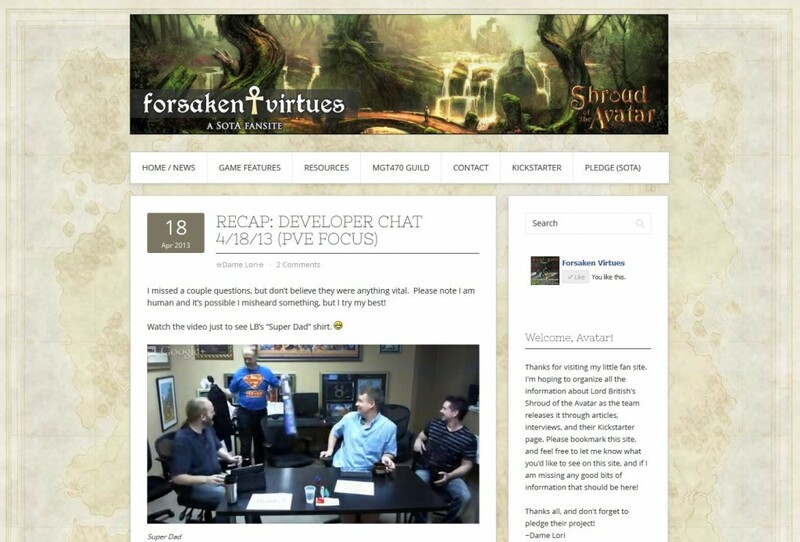 Community Spotlight – A Tale of Rob and Some Leet Video Editing Skills! This week’s Community Spotlight focuses on Rob, a dedicated SotA community member who decided to take on the task of editing our Kickstarter Live Video Streams into something a bit less… ehem… free-form! Not an easy task, I assure you. He has 5 videos currently up on his YouTube channel, and has been generous enough to provide me with the remaining videos, which I will be adding as a playlist on our own YouTube channel this week. So if you missed the tales of Bob the Raccoon Wrangler, Dippy Bird’s first on-camera appearance, or the Epic D&D Adventures of Gorn, now you can discover (or re-discover) the magic of locking 10 Devs together for an entire weekend with nothing but some games, plenty of finger foods, and some pretty big bottles of Scotch! You can watch the remaining videos on Rob’s YouTube Channel. And if you would like to know more about Rob, he has been kind enough to permit me an short interview. My NPC is an extension of myself. I am a teacher, I am an artist. As an NPC, you would find me in the woods, surrounded by green, bustling, babbling, and breathing scenery. This place would be serene, but talkative, much like me. The prodigious war axe lashed to my back would resemble its wielder – slow to anger, quick to rise. My dialogue would be extensive, but in it, you would find wisdom, humor and explicit facts seemingly unrelated to the topic being discussed. By default, I am alone, but not lonely. The Avatars I most commonly cast my lot with would embody the tenants in which I hold dear. Wisdom, reverence, prudence, restlessness and amusement are the qualities of our fellowship. Our attire would be comfortable, our aspects would be pensive and our silhouettes would be robust. My quests are not often followed, but if adhered to, they will bring prosperity to yourself and those around you. What do you enjoy most about the SotA Community? What I enjoy most about the SotA Developers and community is what we are. We are Avatars. We are sincere, charitable, helpful and humble. We act with conviction, integrity, reverence and righteousness. We are fans of Richard Garriott, who has demonstrated these qualities over his many years of service. 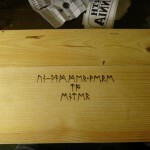 The SotA community loves the work of RG. We revere and cherish it as if it were a living and breathing thing. The greatness of this community is truly inspiring! Many of us have been influenced heavily by the wisdom and knowledge Ultima has revealed. I love that no matter what, Richard and the community fight for what we all believe in to make the best game we can. I love the principle and the devotion of our community. Most of all, I love the possibilities of what we can accomplish. In game, I’m looking forward to the creations, the rituals and the conventions cultivated by the players from the seeds planted by the Developers. I can’t wait to find the individual personality of the things created by my friends and by the Developers in Shroud of the Avatar. 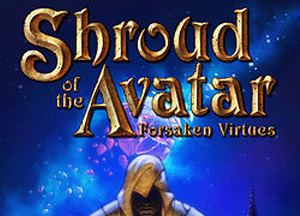 I’m looking forward to being inspired by Shroud of the Avatar, its creators and its community again and again and again. I just want to thank Richard, Dallas, Chris, Tracy, Rick, B. Cotton, Loren, Stephen, Bob, Gina, Tassilo, Erik, Justin and the rest of the Developers on SotA which I have yet to meet or see at the Dev chats. Thank you all for this opportunity and thank you all for being awesome. I wish I had room to individually list at length why you are all so inspiring! Suffice it to say, I really appreciate the participation, candidness, honesty, enthusiasm, and wisdom I have had the pleasure to witness from you all. Good luck, good will and good fortune to you all. The community and I are behind you and all that you decide. Today we kick off our weekly tribute to YOU, the members of our community that have made this journey so memorable for all of us here at Shroud of the Avatar. Whether it’s a fabulous Fansite, Fan Art, SotA Guild, or a piece of Fan Fiction, the Community spotlight is a place for us to share some of the amazing things going on in the community, and show off what a talented, passionate group of fans we have! This week’s Community Spotlight shines on Forsaken Virtues: A SotA Fansite and the incredibly dedicated Dame Lori! If you have spent any time on either the forums or following us during the Kickstarter Campaign, they you already know Dame Lori. She has been an inspiring force in the community, sharing her talent with us in so many ways! Not only did she design our Kickstarter Reward Tier Image, she often cheers us on during our Live Hangouts, then provides the community with summaries of those broadcasts. And she’s always willing to help out on the forums, answering player questions in her own upbeat style. But in case you want to know a bit more about her, Dame Lori was generous enough to allow me a brief interview. 1. If you were an NPC in Shroud of the Avatar, how would describe yourself? I’m a jack of all trades type, so I think my alter-ego would be a villager that has her hands in something different each time you pass by. One day she’ll be tinkering with some gadgets, another she’ll be sitting outside painting. A week later she’ll be brewing up some strange concoctions (you’ll probably see a blast or two shoot out her windows). You’ll certainly catch her trying to out-drink the adventurers at the tavern some nights. Oh, and she’ll always have animal companions looming around – probably more so than human ones! In short… she’d be the local kook, I guess. This is all before the computer and internet comes around and takes over her life, of course. 2. What do you think sets your Fansite apart from the rest? I started my site in hopes of helping the Kickstarter campaign by gathering all of the available game information into one place. I saw that many people were not aware of the wealth of info that was within interviews, videos, Kickstarter comments and so on, and I wanted to guide them so they would understand what a promising project it is! Now that the KS is over, my site continues to be a hub for updates and news as the SotA team releases information. Developer video summaries are now being posted and I try to keep up with the forums to stay on top of the latest issues. It’s great to hear from fans that decided to pledge higher after seeing the rewards chart, or others that are pleased to see concise information because they do not have the time to watch the videos or browse the forums. I’m hoping the site will grow with the game and will continue to be a place folks can quickly find the information they need. I also must add that I think all of the SotA fansites out there are great assets, as are the people who contribute awesome ideas in the forums. I’m just one of many people that are doing what we can to help Shroud of the Avatar be a great success! 3. What are YOU most looking forward to in Shroud of the Avatar? Oh, so much! I quite literally danced around the house the day Richard announced a spiritual successor to Ultima. 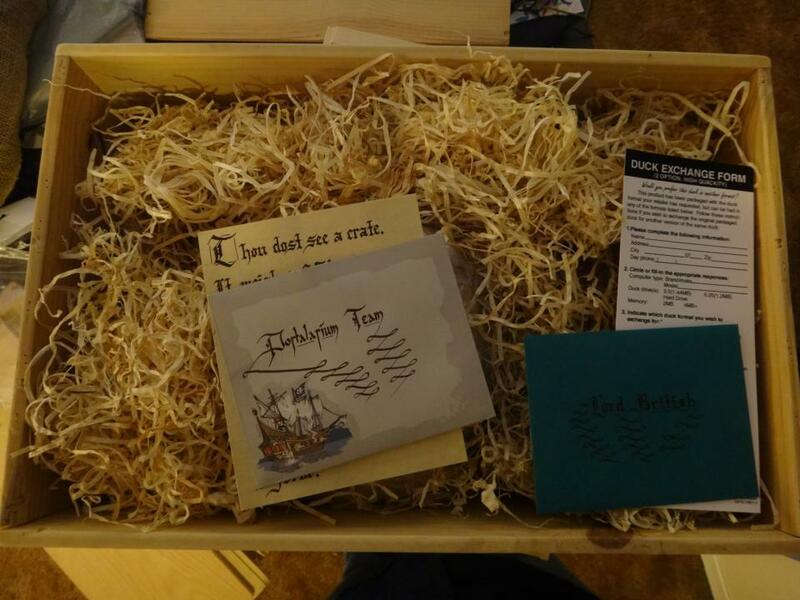 Non-gamers would think it is silly, but Ultima fans understand – Lord British’s work is life changing. His earlier games are part of my fondest childhood memories. The virtue system is relevant in real life and something I still hold close to my heart. I met people in Ultima Online over a decade ago that continue to be my very best friends to this day. 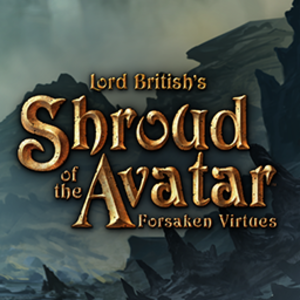 Shroud of the Avatar is set to combine the best features of Lord British’s worlds. I’m looking forward to traveling to another land with characters I will truly care about, and to be left to my own devices to find my way through the adventure without the game holding my hand each step of the way (a game feature I sorely miss.) The crafting and sandbox features will be easy to get sucked into. 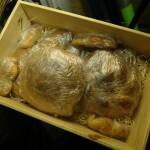 LB got this right even long before UO – I am not the only one who can speak of the fun of mixing water and flour! The idea of being able to choose single or multiplayer depending on your mood is also very intriguing and I wouldn’t be surprised if LB paves the way for a whole new game genre… again! The community and interaction with the Portalarium team has also been heaps of fun and we still have 18 months to go before launch. I can’t wait to see what’s next!